Dave and I will be putting together a Future Forty update when he gets back from his honeymoon but, in the meantime, let’s take a look at some of the highlights and lowlights for the M’s minor-league system this season..
Halman had the best season of any of the team’s top prospects. After struggling with a promotion to Wisconsin last year, Halman was demoted to Everett. He hit there, but it was a repeat year for the 19-year-old. This year, the Mariners had him start the season in the High-A California League, which can do wonders for a hitter’s confidence. Halman didn’t go nuts, but hit a respectable .268/.320/.572 before a mid-season promotion to Double-A West Tenn., where he continued to hit and posted a .277/.332/.481 line. Halman is a great athlete that has a nice combination of power and speed, as evidenced by his 29 home runs and 31 stolen bases this season. However, he’s still very raw and needs to learn to be more selective at the plate. The regime change could slow the M’s aggressive promotion schedule, which I think would be a good thing for Halman. That being said, it was a great year for the Dutch native and he was one of the M’s assigned to the Arizona Fall League. The marquee name was of course last year’s first-round pick, Phillippe Aumont, and, when healthy, he certainly lived up to the hype. After coming down with a sore elbow, however, the M’s were cautious with him and he threw just 56 innings, striking out 50, walking 17 and maintaining a shiny 2.75 ERA. Despite the limited performance, he ranked as the third-best pitcher in the MWL in BA’s latest league rankings. Probably the most pleasant surprise of the season was righthander Michael Pineda from the Dominican Republic. Signed in December of 2005, the 6-foot-5 19-year-old pitched in the DSL last year and put up solid numbers, but nothing jaw-dropping. That changed this year when the Mariners assigned him to Wisconsin for his stateside debut. Although he started out in the Timber Rattlers’ bullpen, he pitched his way into the rotation and was the team’s best pitcher, striking out 128 and walking just 35 over 138.1 innings. Armed with a low-90s fastball and a great work ethic, the guy sounds legit. What gets lost in all of this is that Juan Ramirez made some real strides forward this year as well. If you read Prospect Insider’s 2008 Prospect Handbook, you might know that Ramirez is one of my favorite M’s prospects. I saw him a lot in Everett and, while I loved watching him pitch, he’s almost as fun to watch when he’s off the mound because he’s super hyper and always running around, messing with his teammates and having fun. So it was nice to see Ramirez improve this year. To notice the progress, however, you have to look past the 4.14 ERA. As one of the younger pitchers in the MWL, Ramirez’ strikeout rate of 21.5% ranked 17th-best in the league. While his 7.2 BB% isn’t ideal, if he can keep his strikeout rate over 20, he’ll be fine. Plus, it’s a great improvement from the 12.6% he posted last year in Everett. Aside from Halman, the most impressive statistical performance for an M’s farmhand this year came from catcher Adam Moore. Drafted in the sixth round of the ’06 draft out of Texas-Arlington, Moore has hit at every stop, but put together his best season this year by hitting .319/.396/.506 with 34 doubles and 14 home runs. But curb your enthusiasm a bit. The numbers were inflated by the 10th-highest BABIP (.364) in the Southern League and 16 hit-by-pitches. The reports on Moore are that he still needs to improve his defenseâ€”something he was scheduled to work on in the Arizona Fall League before a broken hand in the final game of the SL playoffs scrapped those plans. So, if he makes the majors, he’s probably going to be a 26-year-old rookie that might be able to stay behind the plate? He could be a very solid backup, but that’s not exactly the pedigree of a top prospect. Rob Johnson’s numbers were good too (.305/.363/.441 over 417 at-bats with the Rainiers), but that’s what you’re supposed to do when you’re in the PCL for the third year in a row. Johnson’s track record indicates he was hitting over his head this year and he’s not getting rave reviews for his catch-and-throw skills either, so he looks like another backup. But, that’s certainly not a bad thing when Kenji Johjima’s posting a .609 OPS and knee issues could have Jeff Clement trading in his catcher’s gear for a first baseman’s mitt. Carlos Triunfel’s overall numbers (.290/.340/.411) aren’t overwhelming, especially when you consider that he was playing in the Cal League, the best hitting environment in the minors. But, after a rough first half, Triunfel really turned it on for the final two-plus months of the season. How bad was his first half? He hit just .195/.253/.260 in April. He did better in May, going .342/.384/.418, but also got suspended for violating team rules and then took a nose dive again in June, hitting .154/.214/.246. Things were looking pretty grim for the number-one prospect in the system. But then something clicked and Triunfel went on a tear to end the season, allowing M’s fans (and probably everyone else involved) to breathe a collective sigh of relief. Through July, August and September, Triunfel busted out the thumping stick, hitting .384/.404/.514 with seven of his eight home runs on the seasonâ€”very impressive numbers for a guy that’s only a few months older than kids that have yet to play their senior year of high school ball. John Hickey recently reportedÂ in the PI that Triunfel is currently down in the Instructional League working on his defense at multiple positionsâ€”shortstop, second base and third base. Bob Engle is absolutely the best thing going for this organization. Just look at the international players that have been signed since Engle was brought in by Gillick: Felix Hernandez, Jose Lopez, Yuniesky Betancourt, Wladimir Balentien, Ryan Rowland-Smith, Shin-Soo Choo, Asdrubal Cabrera and Cesar Jimenez are all big leaguers and our minor league system is filled with high-upside guys from all over the globe. When he was scouting director for the Blue Jays (1991-1995), he also had a great track record, getting major leaguers out of all his first picks: Shawn Green, Shannon Stewart, Chris Carpenter, Kevin Witt & Roy Halladay. Larry Stone reported the other day that Engle is in the running for the GM position, but no matter who ends up getting that job, it’s absolutely imperative that Engle remains in the organization. It’s not unusual for players to take a little time to adjust to the big leagues. So, I don’t think this is a major concern, but it certainly didn’t make the already-painful season any easier to swallow. Clement torched the PCL this year to the tune of .335/.455/.676 but posted a big-league line of just .227/.295/.360. Balentien didn’t go bananas in triple-A like Clement, but hit a respectable .266/.354/.584 before slipping to .202/.250/.342 over 243 at-bats in Seattle. When’s the last time a legitimate Mariners’ prospect has come up and hit right off the bat? Granted, they haven’t produced many positional prospects over the past 10 years, but it seems like young hitters always come up and struggle for the hometown nine. Where’s our Evan Longoria? Where’s our Ryan Braun? Where’s our Travis Snider? Like Engle, M’s scouting director Bob Fontaine is another huge bright spot for the organization, and I hope he too sticks around after the new GM is hired. That said, I was not a fan of this pick. Scouting directors love to preach that they always draft the best player available, but I think you could make a very convincing argument that a relief pitcher is never the best player available. Not in the first round at least. The fact that Fields hasn’t even signed yet doesn’t change my opinion on the selection, althoughâ€”as a side noteâ€”what the hell? His hometown Braves drafted him in the second round last year and he turned them down. Then, he’s picked 20th overall as a college senior and lets Boras try to play hardball? What kind of leverage does he possibly have? None I guess, which is why the M’s are sticking to their guns and not going over slot. I’d honestly prefer them just saying, “screw it” and taking the compensation pick for next year. If that happens and Ibanez leaves, we could have four of the first 40 picks. That would be huge! Let’s just hope this whole ordeal doesn’t sour the M’s from picking a Boras client next year, because he’s advising some of the best guys (surprise, surprise), including Strasburg & USC shortstop Grant Green. A few promising prospects had absolutely horrendous seasons and Carroll was one of them. Last year’s third-round draft pick, Carroll hit well in the AZL last year. This year, however, was a different story. He started the year in the Midwest League where he was hurt part of the year. 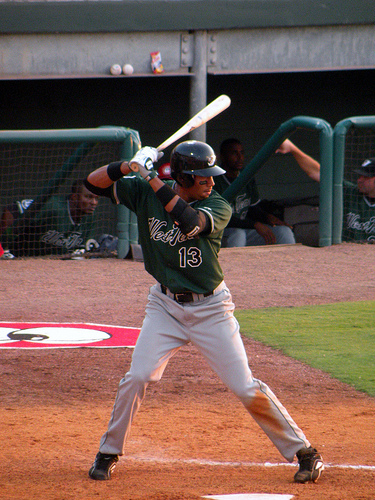 He hit just .248/.321/.324 before a July promotion to the Cal League. The change of scenery didn’t help, to say the least, as his line dropped to .135/.210/.162 over 81 plate appearances. Carroll is a good athlete that runs well and has a strong arm but, as the old scouting clichÃ© goes, if you can’t hit, you can’t play. Not surprisingly, Carroll’s spending the winter in Peoria for the Instructional League. Only six major leaguers in the history of baseball were born in Italy and Liddi isn’t convincing anyone that he’s going to be the seventh. Repeating the Midwest League, Liddi posted a sub-.700 OPS for the second year in a row, hitting just .244/.313/.360. Liddi will be given every opportunity to succeed, because he has good tools, but at some point those tools need to show up in the stats. Liddi is in instructs as well. I’ll admitâ€”I really liked Mangini coming out of Oklahoma State and was excited about the M’s taking him last year in the draft. But, boy, has he looked bad as a pro. Over his first 566 minor-league at-bats, Mangini has hit just .235/.318/.345. His .556 OPS between High Desert and West Tenn. this year was the third-lowest for all M’s prospects that amassed at least 300 at-bats (Carroll had the lowest with .494). That’s unacceptable for a 6-foot-4, 220 pound, corner infielder that was a supplemental first-round pick out of a respectable collegiate program. Right now he’s (you guessed it) down at instructs. Note: Stats for guys like Victor Diaz & Jared Wells that came to the M’s via trade include their numbers from their previous teams. Woo USSM minor league coverage! Raben definitely was a bright spot for me. Adding a left handed power bat who is willing to take a walk is beautiful. The guy I remember at Everett with that fun loving attitude wasn’t as big of a prospect, but was great fun to watch – Jair Fernandez. We sent him to the Twins in order to keep Dickey. I doubt that Jair will ever make the big leagues (but with catchers you never can tell) – but he was a show of his own during warm-ups and the games. Thanks for the minor league info – keep it coming! The guy I remember at Everett with that fun loving attitude wasnâ€™t as big of a prospect, but was great fun to watch – Jair Fernandez. We sent him to the Twins in order to keep Dickey. I doubt that Jair will ever make the big leagues (but with catchers you never can tell) – but he was a show of his own during warm-ups and the games. Yeah, Fernandez was great too. One of my favorite AquaSox memories was watching him blatantly hit on a girl in the stands during the game â€” winking at her, blowing her kisses, etc. The best part was that she was with her mom and was super embarrassed. She kept putting her hand over her mom’s eyes. I would add Saunders, Tui and Nathan Adcock on my own good list. He’s limited defensively, but he’s got a great approach at the plate. It’s certainly refreshing and he almost made the list. Hopefully he can get through next season injury free. Yeah, Saunders and Tui were both good. Keep in mind – this isn’t a list of all the good things that happened, just some. Adcock is interesting, but he’s not in the same class as Aumont/Ramirez/Pineda. He was repeating the MWL this year and basically posted the same numbers as last year. Tui improved a bit, but not enough to be on a list of the best things that happened in the system. In the pleasant surprise category, I’d put the emergence of Luis Valbuena, the solid season put up by Mike Wilson (in his last chance to prove something, he did all that you could ask), and the re-emergence of Cesar Jimenez. The team continues to develop half-decent relief options, and that should help make the next GM’s job a bit easier. I was actually quite pleased with the amount of young lower level talent the M’s showed this year. Just a question, did anyone get to see Jharmidy Dejesus play? Also on a side note, did anyone check out the 92 game year Shin-Soo Choo had. Kind of makes me depressed. So are we going to see Hallman donning the orange for Team Nederland in the WBC? In the short time that Raben was healthy and the four games I saw him play… I was very impressed. He has lots of power and even more patience, which is exactly what this organization needs. Also on the list was Tyson Gillies (15th), another nice late-round find by the organization. but, but …. Jeff Nelson told me on the radio that there was no talent in the minor leagues, and sure they say that was Bavasi’s strength but he didn’t do even that before they canned him…. are you telling me that Jeff was wrong????? As far as Tui is concerned, I just wasn’t expecting very much, so the huge 2nd half power surge really gave me some encouragement regarding his development. While I also think Valbuena was a pleasant surprise, I’m pretty meh on Jimenez. An inconsistent 2nd loogy in the bullpen doesn’t strike me as all that valuable a commodity. Yes and no. There really isn’t a can’t-miss upper-level prospect in the system, and even at the lower levels there is still some projectability questions (ex: Triunfel’s ultimate position, whether all his plus tools will manifest, etc.). Right now there’s a lot of promise from Halman down, but nothing close to the Jones/Tillman/Clement group of last few years. oh, no, there is none and has never been any. He said so. I got to see him once this year, and he was impressive on offense. Oppo field homer, double and a walk, if I remember correctly. Looked awful in the field, though. btw, I would rather be listening to the ballgame than a rehash of the terrible football of the weekend. One thing to note with Ramirez is that his numbers were actually strong until the last month or so, when they slid some. This was Ramirez’s first full pro season, and it’s possible that the long season finally began wearing on his body down the stretch, even given his continued enthusiasm throughout the season, hence his numbers sliding. In other words, I’m not worried at all about his final numbers . As he grows into a full season’s workload, I bet he develops stamina in subsequent seasons and looks as strong as ever into August and September. He’s an immense talent that dominates his competition at his best. I wonder how Saunders is coming along. Most scouts say his power will come along and if he does we’ll see someone like Josh Hamilton don’t know how good he’ll be though after the surgery this year. Ramirez actually got better as the year went on – his final month of the season was quite a good one (33 Ks to 9 BBs in 34 2/3 IP), and he gave up fewer runs per 9 in the second half of the year as compared to the first. It was that terrible JUNE that caused his meh overall numbers (and the fact that he went on the DL in July gives us a hint why). I’m more interested to see if his true-talent level is closer to the 53% GB, 24% K rate pitcher that he was at home or the 46%, 18% guy he was on the road. He’s young, and these are one-year splits (extremely SSS), but he shows flashes of the ability that’s led scouts to rave about him.